Agency issued 3,365 pages of proposed rules in six weeks this summer, CUNA Mutual Group compliance expert tells virtual confab. 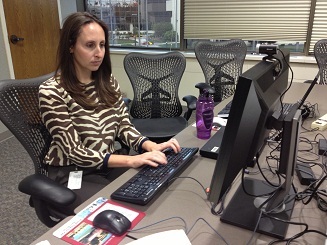 Lauren Calhoun of CUNA Mutual Group prepares for the live question-and-answer portion of her joint session with CMG’s Bill Klewin (not pictured) at the Online Discovery Conference on Tuesday. Credit union compliance staff will spend most of next year on new, proposed and final rules issued by the CFPB, CUNA Mutual Group’s Lauren Calhoun and Bill Klewin told their Online Discovery Conference audience late Tuesday.